Introducing figures to your paintings can be the hallmark to your success. 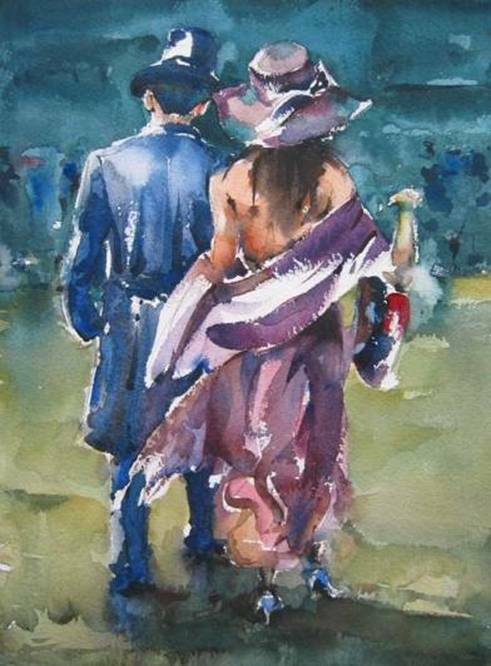 Watercolour painting has been my passion for over 30 years and figurative painting has become a feature of my work. They help to created movement, scale and give character to a composition. By introducing them into your work could be the hallmark to success. In this demonstration I am using Arches 140lb extra rough quarter imperial paper size (15” x 11”). My limited palette is raw sienna, burnt umber, burnt sienna, light red, alizarin crimson, windsor blue (green shade) and french ultramarine blue. I use a size 14 kolinsky sable round pointed brush for all of this painting. Use all parts of the brush to give varying effects and dare use a larger brush than you normally would, this will help you eliminate the temptation to fiddle and help render the shape more effectively. 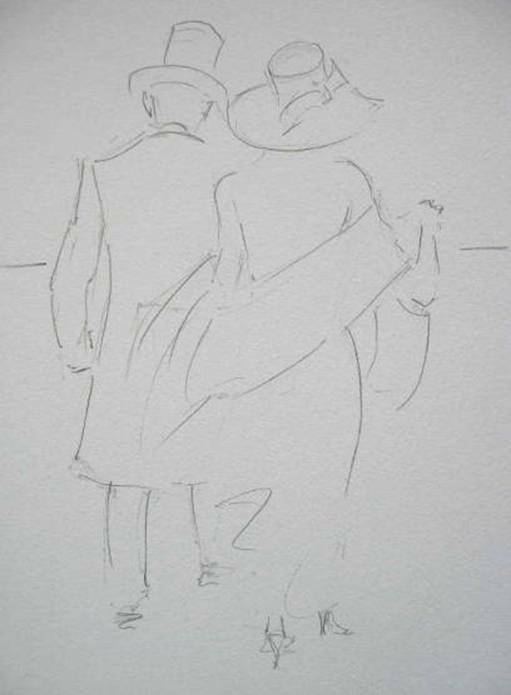 When sketching the figures keep the pencil drawing marks to a minimum so that improvisation of the brush stroke can be made. Consider the pencil lines as guide lines only and not boundaries. Preplan your painting by choosing a colour theme and always decide on the direction of light from the beginning. Changing these at any point in the painting will cause confusion for you and the painting will not be consistent. The first brush marks made are always the scariest when starting a painting. Rather than fiddling with stretching paper, I prefer to bulldog clip my paper to a board. This method reduces my hesitance and allows a more relaxed approach from the beginning. 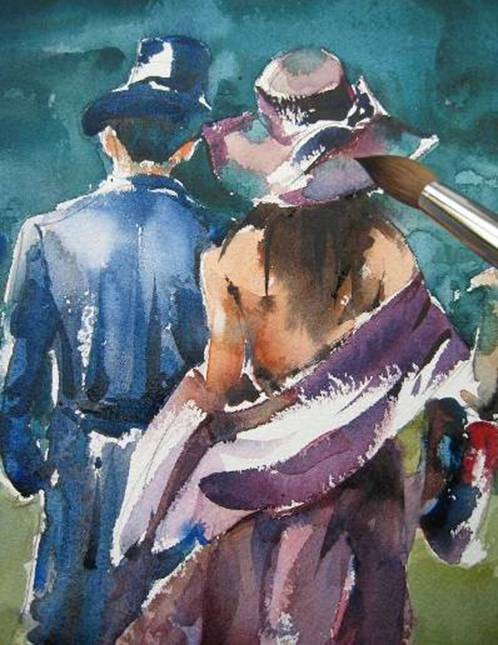 A neat mix of Alizarin crimson, burnt sienna and ultramarine blue is used for the ladies hat. Place the body of the brush to the right and sweep to the left. These dry brush marks help to suggest the hat ribbon and give the appearance of garment texture with sparkle for sunlit areas of the fabric. By using less water in this mix the dry brush technique is more effective. The shawl mix is the same but with a little more alizarin crimson and a little more water this time. I always remind myself through out the painting that the light is coming from the left. The light direction must not be changed once established, to do so will ruin your picture. 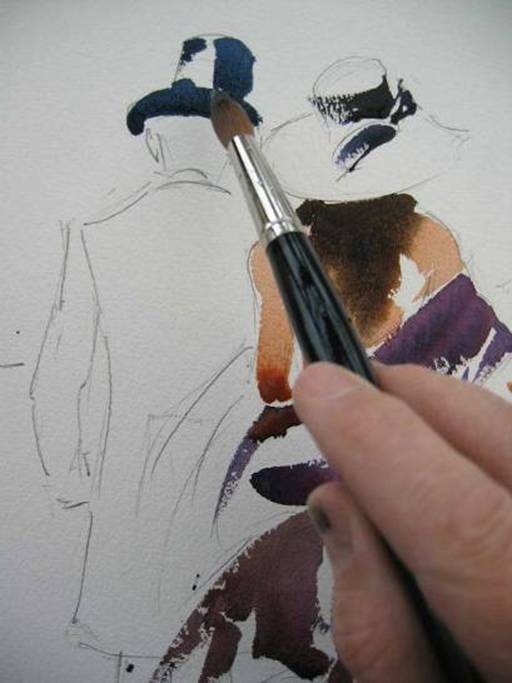 The skin colour is now mixed using light red and a touch of burnt sienna and limit your brush strokes to keep the wash fresh and loose. 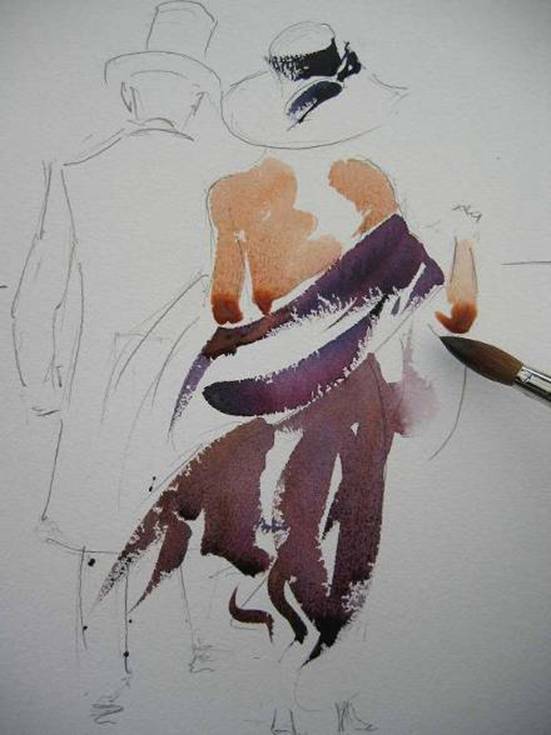 The colour mix for the dress is same as the shawl, but with a touch of raw sienna. These brush marks are applied in downward strokes following the contours of the body. Use a flicking motion at the end of each stroke to achieve a sense of wispiness in the fine fabric of the dress. Note that I have gone past my pencil marks and improvised brush strokes for adjustment on the hips. A wet in wet technique is used here to blend the hair colour into the skin to soften. Don’t worry too much about colours running into each other, these accidents can lead to happy accidents. I then move over to the gent and the hat sets the tone of his wear. Ultramarine blue and burnt sienna makes a nice dark tone. Again I remind myself of the light direction and leave the white of the paper as appropriate. Have you noticed how far I hold the brush away from the ferrule? This enables me to work the brush loosely and with panache. 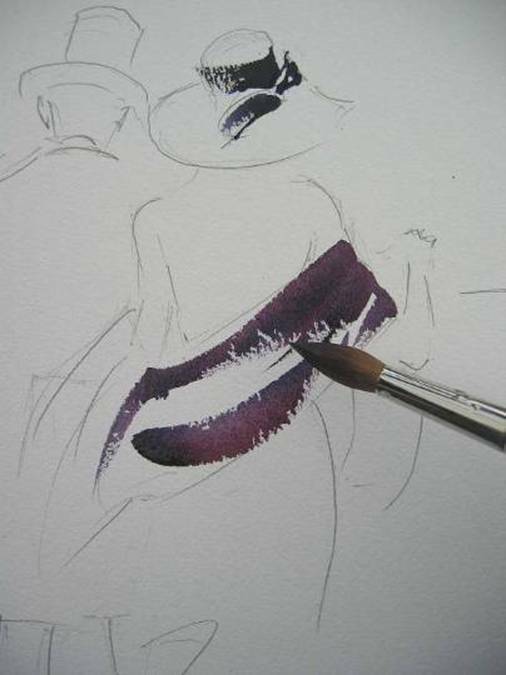 The same hat mix is used for the jacket and the brush strokes again follow the contour of the figure. Imagine the shape of the body underneath the clothing; this method of thought helps to proportion and assist gesture in the figure. Again I remind myself of light direction and ensure the white of the paper is sufficiently retained. By using clean water on the brush I can pull the darker tone colour to the lighter sunlit areas. I then drop in a wet in wet tonally darker mix of the same colour to the shadow areas which gives shape to the figure. Now for some fun! Starting from the top of the paper, a windsor blue and burnt sienna wash is applied and painted round the previous applied figure washes. A second wash of windsor blue and burnt sienna is applied once the first is almost dry, and with a touch of ultramarine added to darken the tone. Keep the brush strokes loose and spontaneous. Remember were the light is coming from and leave those sunlit edges of the figures to create darks against light. Now the painting is starting to sparkle. I mix raw sienna and then add ultramarine blue to make a grassy green. Starting at the point of the lower windsor blue wash I paint a graded wash down to the bottom of the page. Introducing burnt umber and then burnt sienna to this wash warms the ground has it comes nearer to me. Again I apply a second wash after the first has nearly dried which strengthens the tonal value. A few touches of alizarin crimson are dropped into the ladies hat to give interest. I have used this and the happy accidents of the Windsor blue to create a patterned fabric hat. A dark mix of burnt umber and ultramarine blue, applied with the fine point of the brush suggests a few wispy hairs. The ladies hand bag is given a splash of colour and painted with neat alizarin crimson, burnt sienna and windsor blue and blended with clean water. No detail is required here. The drip on the ladies arm has run back, but I am not panicking. The clean, dry point of the brush will soak off suplus paint and create a highlight. Some final touches now. This is where it is tempting to fiddle and can be the most difficult part of the painting. Be selective with your brush strokes. Keep telling yourself that” less is more” and to “stop fiddling”. To make sure figures stand on firm ground and not float, a shadow is introduced at the point of impact. This shadow wash must tonally balance with the rest of the painting. The shadow mix is raw sienna, burnt sienna and ultramarine blue mixed with little water and applied wet on dry. Well the painting is finished!!! and I am quite pleased with the outcome. The dark tones against the white of the paper make the painting sparkle, which is my intention. Always remember that the dark tones lighten has they dry and this must be compensated for. 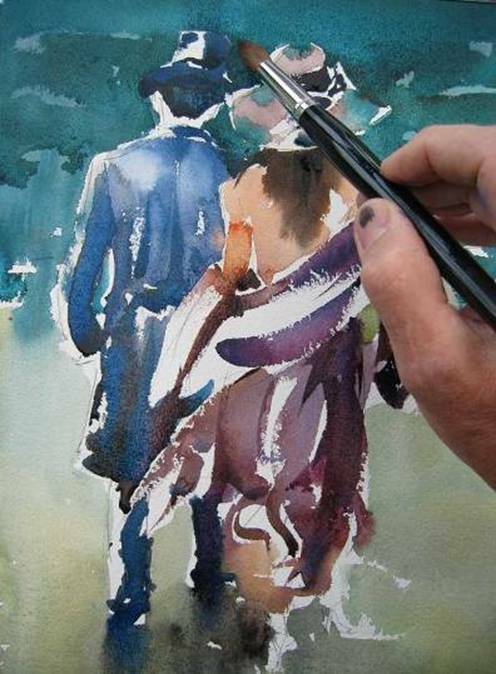 Trevor is a professional self taught artist, demonstrator and tutor of watercolour painting. 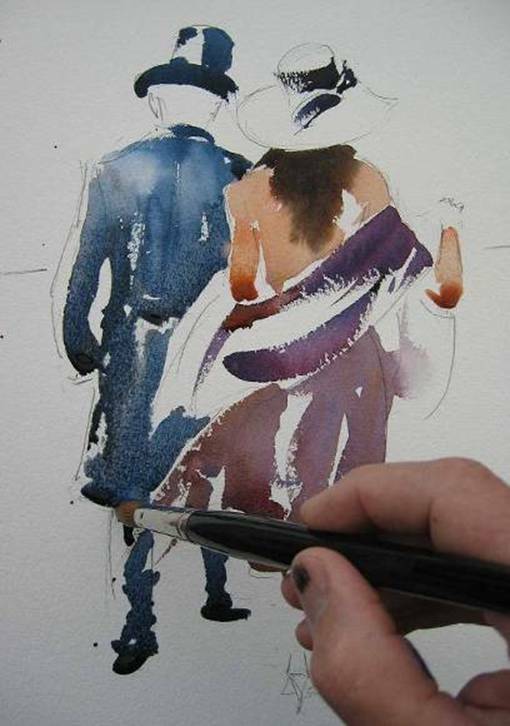 His watercolours are inspiring and the immediate approach to his preferred medium is infectious. Should you wish to view more of Trevors work or require further information on his courses this can be obtained on www.trevorlingard.co.uk. Copyright of this article and images are retained by Trevor Lingard and must not be breeched.